Commodore A3200/A3400 040, REV 2.1 CPU Card - this is an early prototype of the 68040 module that's in the A4000. Here's the story, and where those names came from. 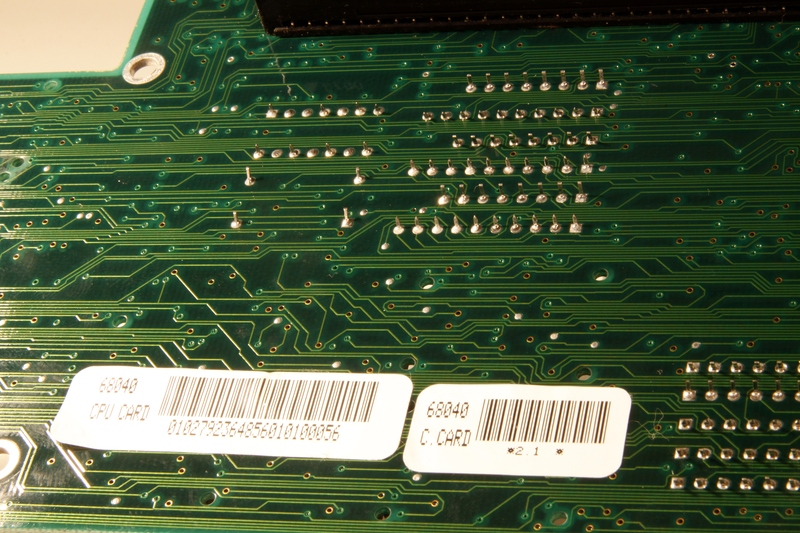 In the spring of 1991, I was working on a thing called the Amiga 3000+, which was the A3000 as you know it, with an AT&T DSP3210 coprocessor, 16-bit CD-quality audio, the Pandora (aka AA, aka AGA) chipset, and a few other things things. I had got the AA chips up and running in a system in February of '91, and by spring we had a second rev of the Alice chip, and full video, OS running, all that stuff... no software support for the new stuff, yet, but I had written some demos that used 8-bit color, that kind of thing. Parallel to this, Joe Augenbraun was working on a system we had dubbed the A1000+... kind of an intermediate machine between the A500 and the A3000. This was going to give you a 25MHz Amiga with fast RAM for under $800, separate keyboard, CPU upgrade option, and two expansion slots... I think we could have sold millions. Anyway, when the evil Mehdi Ali turned his sights on Engineering, having messed with the rest of the company by then I suppose, he pushed Jeff Porter and Henri Rubin aside -- the managemet team that delivered every Amiga other than the A1000, to date. He brought in Bill Sydnes, famous for the IBM PCjr, while at IBM, and stealing Apple's ROMs, while at Franklin Computer. Sydnes immediately set out to sabotage everything currently in the works, just to make sure that none of the good things we were designing would see the light of day. Politics, and stupid ones. Thing was, our schedule had the Amiga 4000 (likely actual name of the A3000+ once it hit the market) shipping by April/May of 1992. The marketing and sales people had been promised this. And there wasn't much of a way to both sabotage the A3000+ and A1000+ and yet still deliver them for sale by April. 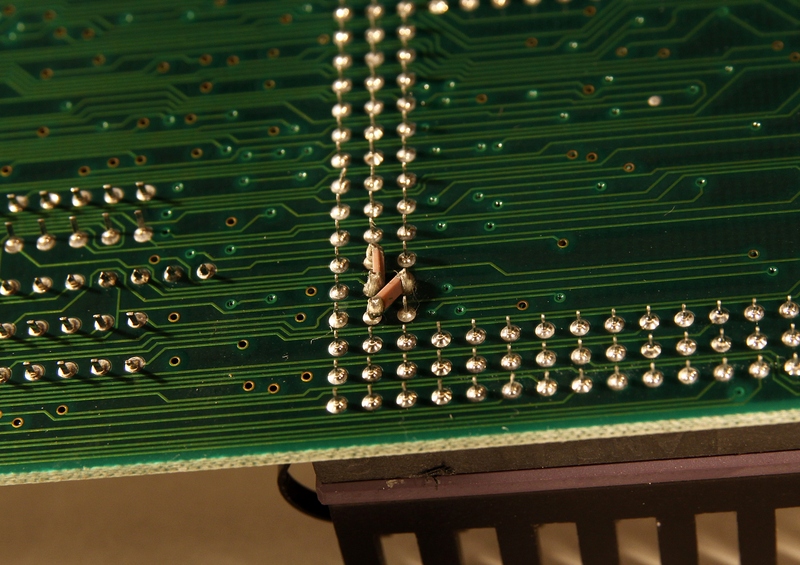 So Syndes and his evil cohorts dreamed up an alternative: they'll just release stripped down versions of the A3000: no AA chips, no 68040 to be found*, etc. They were going strip out SCSI, maybe a few other things. Still got ECS. They did a super simple gate array to lower the cost of the crazy A3000 bus buffering between main, chip, and Zorro bus, to lower cost. And this was going to be two models, a 2-slot machine dubbed the A3200, and a 4-slot machine dubbed the A3400. 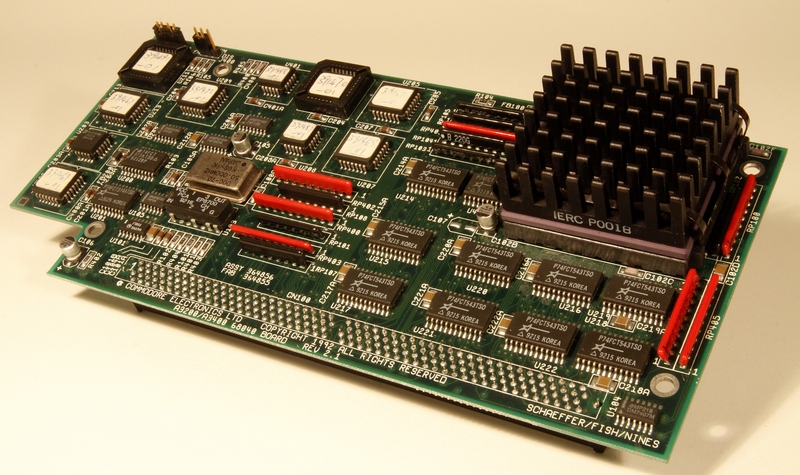 * Here's a thing to consider, too... at the Amiga 3000 launch, in April of 1990, we actually had a prototype of a high performance 68040 board, with its own L2 cache, and of course, AmigaOS running on it. 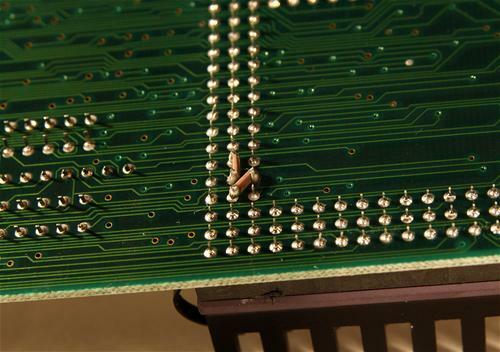 If you look at the photos of the board you have there, you'll see "Schaeffer".. that was Scott Schaeffer, a guy we hired in 1989 to work on 68040 stuff, which at that point was barely even possible, as the chip hadn't been released. So at the A3000 launch, we had to get permission from Motorola to even show the '040 board, because no one outside of Motorola had yet managed to get an OS running on the '040 yet. We actually got that permission pretty right before the debut, but our management got cold feet and didn't show it. So, anyway, my buddy Greg Berlin was in charge of the A3200 and A3400, the only thing I did was fix his expansion bus when it didn't work. He was as annoyed about these models as everyone else, and so, kind of as a skunkworks project, he had Scott design "the cheapest '040 board known to mankind" as he put it, the idea being that, even if these systems went out and didn't impress anyone, we at least had this add-on to turn your A3200 into more or less an appropriate 1992-ish computer. Anyway, then a wonderful thing happened. See, one reason for Commodore's success in those days, and why you saw crazy variation in success... like the UK and Germany dominating, Canada selling nearly as many Amigas all the whole of the USA, etc. was that each Commodore sales division, on a national or regional basis, did their own sales and marketing, with very little influence from Commodore International. As wholly owned divisions of a multinational company goes, they were powerful. So CIL would announce the new stuff we in Engineering created, and they'd do their marketing and sales magic, then place orders, and that basically set the production schedule. And here's the cool thing... no one ordered a single unit of the A3200 or A3400. After all, since 1988 or so they had been told that the A2500 and A3000 were basically stop-gap systems, waiting for better graphics. They needed AA... they wanted AAA. So none of these machines were produced, and Sydnes' went crazy and runshed the A4000 out the door... still a crippled version of what we wanted to do, but at least it was a crippled version of the A3000+ (no SCSI, no DSP, the really bad PATA bus we all loathed).. and Scott's cheap '040 module.. the original A4000 motherboard didn't even have a CPU on it.